Mom's Gone Bronson! 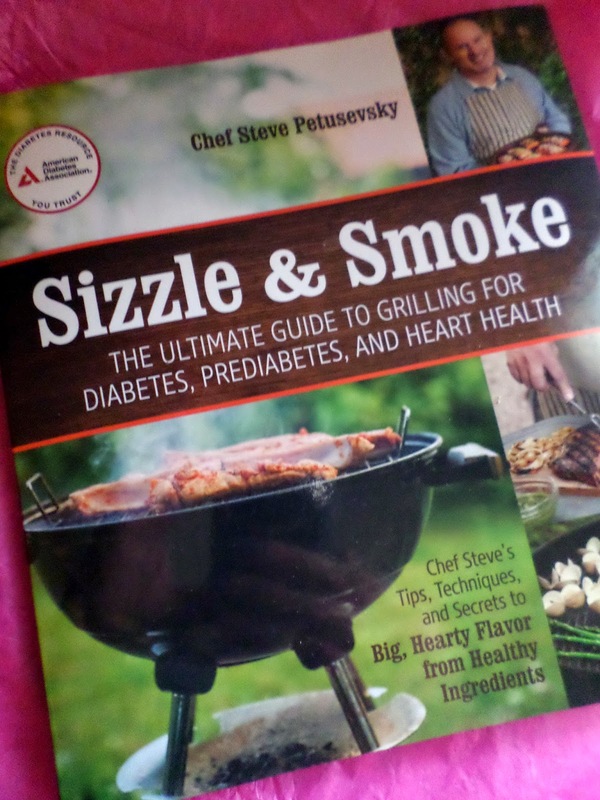 : Sizzle & Smoke: The Ultimate Guide to Grilling for Diabetes, Pre-diabetes and Heart Health from Chef Steve Petusevsky! Sizzle & Smoke: The Ultimate Guide to Grilling for Diabetes, Pre-diabetes and Heart Health from Chef Steve Petusevsky! You don't have to be diabetic to enjoy a diabetic cuisine - and you don't have to suffer bland food as a diabetic or to maintain heart health and wellness in general, either! Chef Steve Petusevsky has launched a fabulous cook-book called Sizzle & Smoke, which is chock-full of grilling recipies catered towards diabetics, those with pre-diabetes and for heart health! With recipes like Avocado Lime Salsa, Grilled Clams with Garlic Better, Southern Style Vegetable Casserole and Grilled Angel Food Cake with Melted Berries, who could resist! With easy to follow recipes, Chef Steve walks you through step-by-step with advice and tricks of the trade, while delivering a huge dose of hearty flavor into every one of your soon-to-be meals! I personally love to cook from scratch and am always looking for new and exciting recipes and my personal favorite in this particular book is, in fact, the Southern Style Vegetable Cassarole, which I mentioned earlier! It is classic and simple yet it looks divine and tastes great! I like to cook healthy and look towards recipes like these that cater for those who need to watch their diabetes or what they eat in general and it tastes so good that you probably wouldn't realise that these recipes were better for you than some of those others we might eat on a daily basis! Why not pick up Chef Steve Petusevsky's Sizzle & Smoke at Amazon or by visiting your local book-store or having a look online! There is something for everyone and I am very excited to try out more of these recipes for myself! In the mean time, you could WIN one of 2 copies of Sizzle & Smoke by entering via the rafflecopter, below! Giveaway is open to U.S residents and there will be 2 winners, each receiving 1 book! Giveaway Rules: Giveaway ends 7/3/214. Neither Mom's Gone Bronson nor any participating blogger is personally responsible for prize fulfillment. No entries are at all mandatory, do as little or as many as you please! Winners chosen at random via rafflecopter and notified within 24 hours of giveaway end. Winners have 48 hours to claim their prize and, if unclaimed, a new winner will be selected via the same process until a confirmed winner is announced - please use a genuine email address to sign up as this is how we will contact you if you win! We do not share or distribute your email address or personal information with any 3rd party. Good luck! Disclaimer: I was given a copy of this book in order to give my frank, honest thoughts. I was in no way monetarily compensated for my views. Your views may differ from mine. Thank you!